Blumenthal And Feinstein Among Those Who Want FAA To Ground Boeing's 737 Max Sens. Warren, Cruz and Romney among lawmakers who want the FAA to ground Boeing's series of jets involved in recent crashes. Dozens of other countries already have. Responders at the scene of an Ethiopian Airlines flight crash. Countries around the world have grounded their Boeing 737 Max jets and there is growing political pressure on the Federal Aviation Administration to do the same. As countries worldwide continue to ground their Boeing 737 Max 8 aircraft, aviation officials in the U.S. have been hesitant to follow suit. The Federal Aviation Administration says there is "no basis to order the grounding of the aircraft." That's according to a statement Tuesday evening from Daniel Elwell, the acting FAA administrator. "The FAA continues to review extensively all available data and aggregate safety performance from operators and pilots of the Boeing 737 MAX," the statement reads. "Thus far, our review shows no systemic performance issues and provides no basis to order grounding the aircraft. Nor have other civil aviation authorities provided data to us that would warrant action." 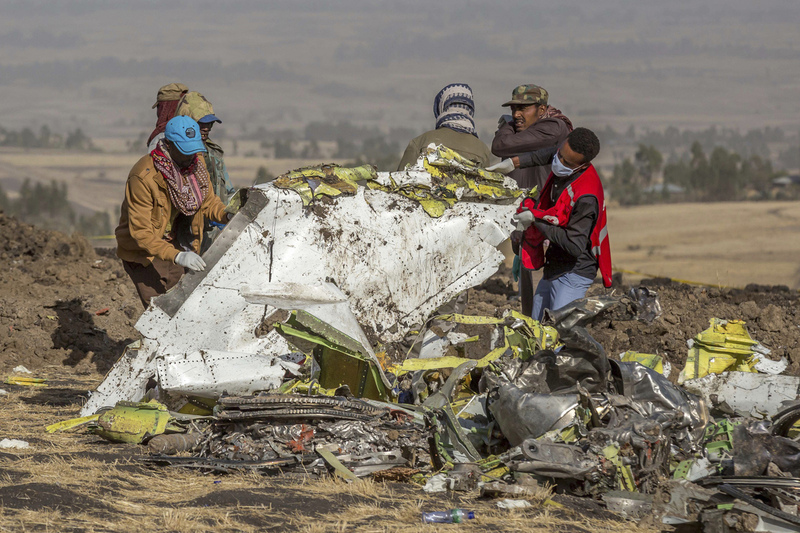 Ethiopian Airlines flight 302 crashed on Sunday, killing all 157 passengers and crew on board. Just five months earlier, a 737 Max jet flown by Lion Air crashed off the coast of Indonesia killing all 189 people on the plane. Tuesday, the European Union Aviation Safety Agency announced it was suspending all flight operations of the Boeing series of jets involved in the crashes. That follows similar moves by China, the United Kingdom, Singapore, Australia and others to either ground the planes or temporarily ban them from their airspace. And on Capitol Hill there is a growing chorus of lawmakers from both parties calling for the FAA to do the same. Speaking on NPR's All Things Considered, Sen. Richard Blumenthal, D-Conn., said the FAA has a responsibility to put "safety ahead of airline profits." "Right now there's more than ample reason for airline passengers to be greatly concerned. In fact, justifiably frightened about the safety of these airplanes and the ability of pilots to handle a malfunction," Blumenthal said. In a statement Texas Sen. Ted Cruz, a Republican, agreed. "I believe it would be prudent for the United States likewise to temporarily ground 737 Max aircraft until the FAA confirms the safety of these aircraft and their passengers." Cruz, the chairman of the Subcommittee on Aviation and Space, said he plans to hold hearings on the matter, "to investigate these crashes, determine their contributing factors, and ensure that the United States aviation industry remains the safest in the world." Sens. Elizabeth Warren, D-Mass., Dianne Feinstein, D-Calif., and Mitt Romney, R-Utah have also called on the FAA to ground the planes. According to NPR White House Correspondent Scott Horsley, President Trump spoke to Boeing CEO Dennis Muilenburg on Tuesday. It's a sign of just how extreme the stakes are for one of the nation's most prominent companies. In a pair of morning tweets, which came before the Trump's conversation with Boeing's CEO, the President weighed in on Ethiopian Airlines tragedy by lamenting that present-day planes are becoming "far too complex to fly. Pilots are no longer needed, but rather computer scientists from MIT." The FAA said in its notice on Monday that as part of its "ongoing oversight activities" it expects Boeing to complete flight control system enhancements "which provide reduced reliance on procedures associated with required pilot memory items." The FAA said it expects those updates sometime next month.